When we were planning this trip, it all sounded so simple . . . greet the grandbaby, buy a house, quick, fly to Seattle, fly back to Pensacola, kiss the grandbaby and fly to Doha to pack. Not quite the way it turned out. When we got here, the grandbaby was 11 days overdue. We got to be here for the birth. While our son and his wife labored, we went out with the world’s most wonderful real estate lady and actually, we did find a house. Three years ago, we found a house. When I talked with the mortgage people, I said “We just finished paying off a mortgage with you; isn’t there some kind of short-cut you could do with me?” and they did something called “fast track” with me, and it was so easy I can’t even remember the paperwork; I think I filled it out on my computer – online – and that was it. My son handled the closing. It was so easy. Things have really changed. This will be our third mortgage with the same company, but you would think we are potential deadbeats. We have high credit scores, an impeccable payment record – I would think they would want to have us as customers! It’s like pulling teeth. Papers don’t get to us. Additional verifications are required. Appraisers actually enter the house and verify square footage. Between chasing paper and soothing the newborn, my life has been very full. It doesn’t sound very exciting, when I tell you about it, but here is the truth – I know I am exactly where I am supposed to be right now. It’s an amazing feeling. Today, I spent a lot of time with the baby. At some point, I realized I wasn’t going to make it to Seattle this trip, and it’s OK. I can go to Seattle later. For right now, I have enough on my plate. I had forgotten, too, how chaotic life with a newborn can be. His needs take precedence, and sometimes we all run around trying to guess what those needs might be, simple as they are . . . clean diaper? 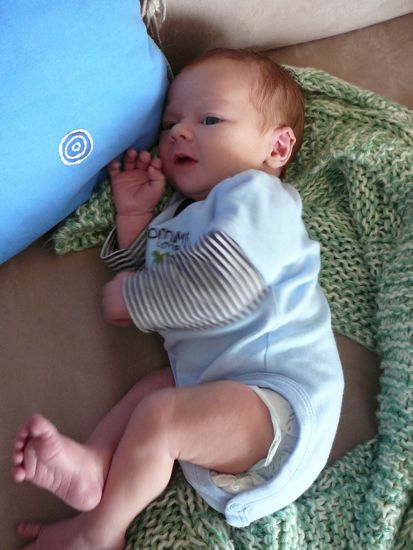 swaddling / soothing to sleep? Mother’s milk? Today was a really good day, where he took the diaper changes with grace, dropped right off to sleep after every meal, and was keenly alert for maybe a half hour after feeding before napping. He loves patterns and fabrics. I am having SO MUCH FUN! For one thing, the world has changed. With e-mail and VOIP phones and people who jump on a plane at the drop of a hat, we expect to stay in touch with those we love and treasure. We expect they will come see us. It’s kind of fun settling in a place with white sandy beaches that everyone wants to come visit. 🙂 Cooler than Kuwait and Qatar in the summer time, too! Nice warm winters, well, not this winter, brrrrrrrrrrrr! It took me 20 days, but I finished Barack Obama’s Dreams From My Father. I didn’t read it because he is President of the United States, although that would be a good reason, but I read it because our book club is reading it, and I know how busy the next few months are going to be, so I read ahead during the slower times of summer. And the trick to finishing it was not allowing myself to read anything else until I had finished – I had a stack of really intriguing books to urge me on. “As soon as I finish, I can read . . . ” Even with all that incentive, Obama’s book is a slog. He is a gifted orator. He is a plodding writer. There is also a problem I find with autobiographies by anyone – we all fool ourselves, we all position ourselves in a better light, and we have no idea how transparent we are when we do so. Fellow bloggers, do you ever read anything you have written a couple years ago and squirm with embarrassment, or even delete? To be an author is a very very brave thing, when you have a book published, there is no going back, your transgressions are all right out there, and the public can be cruelly critical. What I liked about the book is Obama-as-Third-Culture-Kid, a man of mixed identity. Most kids who have grown up moving or grown up in different countries from their own, or who have immigrated, can tell you, being an alien is no fun. Obama learns how to adapt, how to look for clues to fitting in, how to pass. It’s a common theme in Third-Culture-Kids. My favorite part of the book was his return to Kenya, his openness to his African roots, the open-armed love with which his Kenyan half-brothers and sisters welcome him and his response. He had some truly extraordinary adventures, working out just who his father had been as a person. He was blessed to recognize the richness of his inheritance. We have a wonderful week coming up – Liberation Day and Kuwait Independence Day, back to back. If you haven’t already made the trip downtown to see all the fabulous lights, go for it. There is also a house along Highway 30 (Fehaheel Highway) with a HOUSE SIZED flag on it, and many many houses with huge flags – it is a stirring sight, seeing so much love of country demonstrated. Your challenge for this week: Go forth and show us what you see. Show us the faces, show us the lights, show us the celebrations. Show us the “arda” (I might not have spelled it right, the war dance done with swords), show us the children, show us the hooligans. Show us the weary cops. Show us the multiple facets of Liberation Day/Kuwait Independence Day. The prize, as usual, is recognition by your fellow photographers, and photography connoisseurs. We vote, but the voting can be heavily influenced by mass manipulation and politicking, so the photos we share, we share for the love of the challenge. If you haven’t played before, it is easy. You send your photo or photo to me, Intlxpatr@aol.com, 550 pixels maximum in any direction, and I will print them with your name. At the end of the challenge – I am arbitrarily saying March 7th – I will post a poll and people can vote, but the major part of the fun is taking the photo and having your photos posted so your fans can make encouraging comments. I started Zanzibar Chest in December, and could not get into it. It was interesting, but at first the tone was . . . I don’t know, maybe pompous? Something in the tone put me off, and yet I didn’t put it back on the bookshelves, nor did I give it away. It sat on my bed table while I attacked lesser works, more enjoyable fare. Then, one day, I just knew it was time to try it again, and this time, I could hardly put it down. 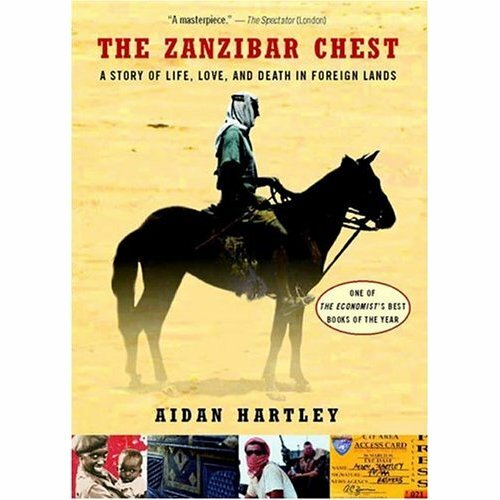 Born in Kenya, just before the rebellion, Aidan Hartley spent his life mostly in Africa. He skillfully interweaves three main story lines – the life of his mother and father, the life of his father’s best friend and his own life as a news correspondent. This is not a joyful book. It is not inspirational. It is a tough, hard look at the people who cover the news, and the toll it takes on their lives. It is a story of drugs and alcohol to numb the pain of what they are observing, the comraderie of gallows humor and surviving the intensity of living through life-threatening moments together. He covers some truly awful events. He covers the wars in Somalia, and in Rwanda. He covers Kosovo and Serbia. He is sent into some of the most dangerous and awful of places. He pays the price. In his Zanzibar Chest, he takes us with him. I will share a couple quotes with you, and if you are sensitive, please stop reading now. This book is not for you. It is almost not for me, except that sometimes I think we need to come face to face with just how awful reality can be to put our own lives right, to set appropriate priorities. “I can’t put my finger on exactly how death smells. The stench of human putrefecation is different from that of all other animals. It moves us as instinctively as the cry of a newly born baby. It lies at one extreme end of the olfactory register. Blood from the injured and the dying smells coppery. After a cadaver’s a day old, you smell it before you see it. From the odor alone, I could tell how long a body had been dead and even, depending on whether brains or bowels had been opened up, where it had been hacked or shot. A body would quickly balloon up in the tropical heat, eyes and tongue swelling, flesh straining against clothes until the skin bursts and fluids spill from lesions. Flies would get in there and within three days the corpse might stink. It became a yellow mass of pupae cascading out of all orifices and the flesh literally undulated beneath the clothes. The tough bits of skin on the palms of their hands and the soles of their feet were the parts of the body that always rotted away last. As living people, these had been peasants who had walked without shoes and worked hard in the fields. A man who had been dead seven days reeks of boiling beans, guava fruit, glue, blown handkerchiefs, cloves and vinegar. After that he starts to dry out into a skeleton until he’s almost inoffensive . . . These guys all suffer from Post traumatic stress syndrome, they deaden themselves with drug and alcohol, and they are totally addicted to the adrenalin rush their job gives them. Living on adrenalin takes a huge toll – on their health, on their mental health, on their relationships, on their belief in goodness. They are the witnesses to the enormity of man’s inhumanity against one another. “It was impossible for latecomers to comprehend the evil committed here but the British military top brass were still so scared of what their soldiers might see and what it would do to their minds that they sent a psychiatrist to accompany the forces to Rwanda. Bald Sam and I were amazed at that. We laughed about it. A shrink! It seemed extravagant. But the truth is that we stuck close to that man for days. We said it was all for a story, but really it was about us. The psychiatrist, whose name was Ian, told us his special area of interest was the minds of war correspondents. I could see Bald Sam squirming with happiness at all the attention, and I felt quite flattered myself. . . . This is not a book I really wanted to read, but it is a book I will never forget. Hartley doesn’t spare himself in the telling of this tale. He takes us with us and shows us all of it, and all of his own warts along with the tale. Would I recommend this book? Not for the sensitive, not for those who don’t want to look at the dark side. Between idyllic sequences on the beaches near Mombasa, in the hills of Kenya and Tanzania, in the dusty deserts of Yemen, there are some very intense and bloody moments. This is non-fiction, it is a documentary, it is a slice of the real life one man has seen, and that to which he has been witness. Read the book, and like him, you pay a price. You carry images in your head that you can’t forget, and a sorrow for our inability to solve our differences peaceably. You might think I love to cook. You would be very wrong. That’s pretty much what I do, and why I have been giving you all these great recipes. The truth about the recipes I am giving you is that most of them are EASY and they taste good. A few require special equipment and mastering a new skill, but it’s like swimming – once you’ve done it, it’s easy. There is nothing complicated about the recipes I am sharing with you – they are ones I use, too! First I will share with you two books available through third party vendors at Amazon. 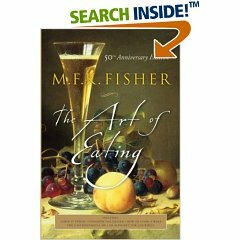 The first is Food Lover’s Companion (A Comprehensive Definition of Over 4000 Food, Wine and Culinary Terms) by Sharon Tyler Herbst, which is available starting at $14.93, and the second is M.F.K Fisher’s The Art of Eating, also available through Amazon at $11.53. 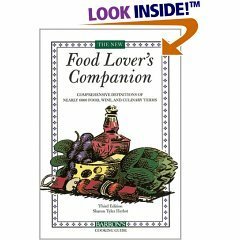 The Companion is invaluable when someone uses a term for a cooking technique or ingredient you don’t know; it has words for everything! My husband reads this book sometimes just for fun and is always sharing new information he has learned. The MFK Fisher book is just plain fun reading about food, full of information and anecdotes and stories, written in an enormously readable way. Actually, I love reading cookbooks. I have a huge collection. And almost all of them are Junior League Cookbooks. So here’s the secret – when you are looking for cookbooks, look for ones where women who contribute have to put their names. If their name is on the recipe, you can trust that the recipe will work, and that it will be one of their best recipes – they don’t want to be embarrassed! The majority my cookbooks are from the South. And narrowing it down even further, most of my favorites come from Louisiana or Georgia. The first one I ever bought was Talk About Good! And oh, it WAS good! These recipes use ingredients like real cream and real butter and lots of salt. Southern people have some of the lowest life-expectancy rates in the United States – I suspect their eating habits have a lot to do with it. But if it isn’t a habit to eat so richly, every now and then it just tastes SO GOOD to use these ingredients. You will also notice that it has what they call a “plastic comb” binding. That means when you open it up to follow a recipe, it will lie flat. That’s a really good thing! My second favorite is Quail Country, by the Junior League of Albany, Georgia. You would really have to scour the book stores to find this out-of-print classic, because so few people would ever want to part with it. Another gem is The Fort Leavenworth Collection, if you can get your hands on it – again, yard sales, used book stores would be your best bet. 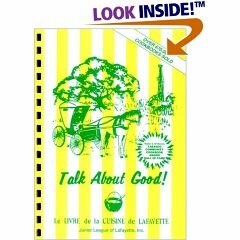 There are some other fabulous Junior League cookbooks – the California Heritage Cookbook, the Seattle Classics, and there are other cookbooks produced by churches and charities that also have “real people” recipes that are drop-dead good. I remember once sharing a recipe for Chocolate Cheesecake from Seattle Classics. My friend told me she made it for Christmas dinner, but everyone was too full to eat dessert. But she said all night she heard doors opening and closing, as people snuck down to the kitchen to slice a little of the cheesecake and eat it, and in the morning, only a fragment was left! Seeking out the best cookbooks can make every vacation an adventure. I have cookbooks from Kenya and Tunisia, Qatar, Jordan and Saudi Arabia . . . all full of great recipes, recipes with names attatched. I wish you a grand adventure seeking out cookbooks that will thrill your heart. Happy Hunting! This is a story I saw in last week’s Kuwait Times, but I can’t get it out of my mind. This humble man, with his ongoing search for knowledge, is an inspiration to me. ELDORET, Kenya, Nov 15 (Reuters) – With his stubbly grey beard and walking stick at his side, 86-year-old Kimani Maruge looks a little out of place among the rows of children sitting behind wooden desks at Kapkenduiywo Primary School. Yet classmates 10 times his junior would be hard-pressed to match the enthusiasm of Maruge, a farmer and veteran of Kenya’s 1950s anti-colonial Mau Mau revolt, who has the distinction of being the oldest pupil on the planet. “I will only stop studying if I go blind or die,” Maruge says at the crowded school in a poor neighbourhood outside Eldoret in Kenya’s western farmlands. The illiterate great-grandfather – who has outlived 10 of his 15 children — jumped at a belated chance to educate himself when President Mwai Kibaki introduced free primary schooling in the east African nation in 2003. Enrolment across Kenya shot up overnight, with 1.2 million more children going to school. Kapkenduiywo had 375 pupils before Kibaki’s measure, and now has 892. But there are none quite like Maruge. He says his inspiration came from listening to a preacher in church and suspecting he was misinterpreting the Bible. “I wanted to go to school to be able to read the Bible for myself,” he says, tucking his long legs under a tiny, shared desk at the front of his overcrowded classroom of 96 pupils. “And in case there is ever any compensation for us Mau Mau, I would like to be able to count my money properly at the bank,” he adds with a large grin. When he first turned up at the school gates in regulation knee-length socks, cut-off trousers and navy blue jumper, Maruge was greeted with laughter. Teaching staff tried at first to direct him to adult education classes. But when he returned again and again, they realised he would not be deterred, and anyway there is no legal age-limit for primary school entrance in Kenya. In the classroom, Maruge’s favourite subjects are Swahili and maths, but he struggles with English which is new and strange to him. He is treated like any other schoolboy except for one privilege: tea at break. Fellow pupils treat him with care and respect, and love to listen to his tales of Kenyan history between classes. Hobbling on a foot he says was disfigured when he was tortured by British colonial captors during the Mau Mau revolt, Maruge cannot keep up with all the playground games. But he watches with relish and is always surrounded by chattering kids. Known in his neighbourhood as “Mzee” – a Swahili term of respect for an elder – Maruge is happy to show off his new knowledge, reading passages of the Bible slowly and clearly in front of his house after school. Although still living humbly, Maruge has become a national celebrity and something of a poster boy for free education campaigners worldwide. Last year, he was feted at the United Nations in New York. This year, a Hollywood crew are working on a film about him.